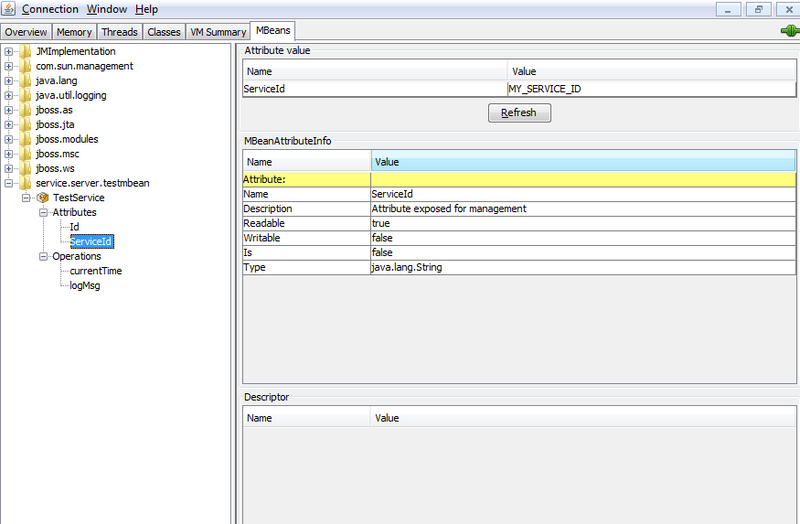 I have created a MBean and have deployed in Jboss 7.1.1 final. The problem I am facing is, when I try to invoke methods of MBean, for some of methods is says NoSuchMethodException when I see it in JConsole, some of the methods have been converted into attributed. If you will provide a Setter method like "setId" then "Id" will be treated as an Attribute of your MBean. Same way is you provide a Getter like "getServiceId" then "ServiceId" will be considered as an Attribute to your MBean. So if you just want to provide methods (operations) inside your MBean then do not prefix any method with "set" or "get" keywords. Thanks for reply, but I think It was working with jboss 5.x. and is it as per specifications? straightforward way of making a new resource manageable.